Benny Hinn lies about heretical statements he made, as well as his testimony. He is credited as being a mentor for John Arnott of the Toronto Airport Christian Fellowship. "Television preacher Benny Hinn, whose sales in Christian bookstores in the last year-and-a-half have exceeded those of James Dobson and Charles Swindoll combined, told CT last September that he would submit to the counsel and constructive criticism of others (Christianity Today, Oct. 28, 1991, p. 44). But Hinn's rhetoric since then has raised questions in some people's minds about his sincerity. For instance: "Now I'm pointing my finger with the mighty power of God on me. ...You hear this. There are men and women in Southern California attacking me. I will tell you under the anointing now, you'll reap it in your children. You'll never win. ...And you children will suffer. You're attacking me on the radio every night; you'll pay, and your children will. Hear this from the lips of God's servant. You are in danger. Repent, or God Almighty will move his hand. ..." That is what Hinn told an audience on August 7 at Melodyland Christian Center in Southern California." Benny Hinn visits Kathryn Kuhlman's and Aimee McPherson's graves for the "annointing", and other wacky things. "The secret to Hinn's power is his peculiar anointing, which he connects with Kathryn Kuhlman and Aimee McPherson, founder of the Foursquare Gospel Church. He first felt the "full power of the Holy Spirit" on him at a Kuhlman healing service in 1973-- and her mantle has presumably fallen upon Hinn. He conducts his meetings almost exactly like hers -- though it takes Hinn much longer to get his audience into the expectant mood that seems to generate psychosomatic "miracles." In an April 7, 1991 sermon, Hinn revealed that he periodically visits Kuhlman's grave and that he is one of the few with a key to gain access to it. He also visits Aimee's grave, where he says: "I felt a terrific anointing ... I was shaking all over ... trembling under the power of God ... `Dear God,' I said, `I feel the anointing.' ... I believe the anointing has lingered over Aimee's body." Here's another version. "Hinn claims to actually be a channel for God-that God enters him and takes over his mind and tongue to the point where he is unaware of what he has said. After his sermon on December 31, 1989, at Orlando Christian Center, during which he gave several future prophecies, Hinn expressed that he was drunk-presumably on the Holy Spirit-and asked someone to tell him what he had just said. In another statement, Hinn asserts that though we are not Almighty God Himself, nevertheless, we are now divine (12/1/90 TBN)." " After attending a Hinn meeting in New York, a pastor wrote the following to our Gen. Superintendent, Rev. Thomas Trask, Gen. Sup't., AOG." These types of letters may have resulted in Hinn "resigning" from AOG. "As we told you briefly in the last issue of The Inkhorn, Benny Hinn resigned his credential with the Assemblies of God. His resignation was accepted in late October (1996). Hinn has indicated to district officials in Florida that he was pressured to resign by officials at the denominational headquarters in Springfield. The Springfield officials have denied this, but then again they denied that Benny Hinn would be anything but a blessing to the movement." Hinn's "resignation" may also be the impetus behind his recent condemnation of the manifestations at Brownsville AOG. Here is a previous example of Benny Hinn recanting things he was preaching and doing, only to subsequently go back to doing and saying those same things. Can we trust what Hinn has now said about "preaching the gospel only" and "manifestations" at Brownsville being of the devil? If you believe that, you'd better read this article where he recanted and -- and then remember all the times since 1993 that you saw him do and say the same heretical things he has always said. An e-mail that is a thoughtful commentary that brings up some deep issues regarding Benny Hinn's new view of himself as an orthodox Christian, who is now against manifestations at Brownsville AOG and is for preaching the full gospel message. Benny Hinn is an admitted necromancer. Judge for yourself, by Hinn's own account of when the "anointing" on his ministry "doubled" whether or not this "anointing" is from the Holy Spirit or from contact with evil spirits posing as dead people like Elijah and Kathryn Kuhlman. The Bible states clearly that necromancy, talking to the dead (actually evil spirits), is an abomination to God: Duet 18:10-12 "There shall not be found among you any one that maketh his son or his daughter to pass through the fire, or that useth divination, or an observer of times, or an enchanter, or a witch, Or a charmer, or a consulter with familiar spirits, or a wizard, or a necromancer. For all that do these things are an abomination unto the LORD ..." Saul was judged by God for trying to bring up the spirit of Samuel, the only time in history that God permitted this for his own purposes. Read this entire account from the lips of Benny Hinn. There are only three possibilities. Either he actually had these experiences, which is impossible according to Scripture; or he made them up out of his own imagination, in which case he is a liar and need to repent; or these were actual demonic encounters. Even if this account is a mixture of imagination and demonization, ALL CHRISTIANS SHOULD STAY AWAY FROM THE COUNTERFEIT ANOINTING OF BENNY HINN, and the rest of the Third Wave. Here is a chapter from the famous book "Occult ABC" by Kurt Koch. It is significant that Koch felt he should include Kathryn Kuhlman in this book. This is the woman that Benny Hinn received his "anointing" from and whose grave he visits to receive more "anointing" on occasion. She is the same woman who was a mentor for John Arnott at the Toronto Airport Christian Fellowship, where the Toronto "Blessing" subsequently began. Note the striking similarities between what is going on in the "counterfeit" revival movement today and Kuhlman's meetings. This is one of the bad seeds that started this whole mess to begin with. Would that more research were being done into the fantastic claims of "healings" today. 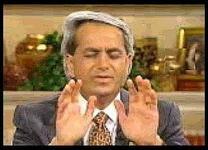 Many of Benny Hinn's "miracles" have been debunked already. Yet adherants to this Third Wave movement continue to tell and retell completely unsubstantiated and subjective stories, because the "end justifies the means". We must continue to expose the false miracles, teaching and prophesy in this movement for what they are, while reaching out to the people who have been fooled by these Christian sorcerers with prayer and with arms of love. "When we recognize our own guilt, the desire to cast stones goes away. Nevertheless, we are not spared the necessary duty of acting as signposts to the Church of Christ, even when this means great heartache." Here is one example from the past where Benny Hinn admitted heretical teaching, yet did not really follow through on making a public apology for something that was taught in public. This is a pattern with Hinn. He continues to apologize for some of his many heretical statements and actions, yet does not go back to teaching sound doctrine but rather continues teaching, preaching and evidencing further heresy. "It is apparent that Mr. Hinn is not being completely honest. The fact that he has admitted his errors is admirable, but means nothing if his words cannot be trusted." "The man of iniquity is about to be revealed. False teachers like Benny Hinn are merely setting the stage for the final apostasy that is coming. All the world's religions will join together in the "anointing" that is not of the Holy Spirit, and have one big millennium party. The sad thing is that, over the shoulder of the Third Wave, even while they are fiddling their lives away, the rest of the world will be crashing and burning in sin and doomed to ultimate damnation." Messiah's' and ‘little gods'. He has even gone so far as to state, in reference to himself, ‘I face devils as the Son of God.'" "To date, Mr. Hinn is continuing with the same horrible faith teaching, false prophecy, and gross theological error. Noted charismatic theologian J. Rodman Williams repeats his warning that "Hinn is prone to exaggeration and extremism...[his[ exegesis is frequently unsound and unbiblical", and after attending some of Hinn's services writes that in those meetings "psychological techniques are mixed in with the spiritual." "Hinn’s move in the direction of the occult should not be a surprise. The modern-day Pentecostal movement, which began in 1906, has muddled beginnings and a prior history of involvement in spiritism. Azusa Street drew in spiritualists and mediums and contemporaries of that day were reporting seances, trances and other outlandish and occultic behavior. Once the door of unrestrained subjective mysticism is opened, Satan and the flesh can have a field day. God’s Word is our only protection against the demonic as well as ourselves. " Here's an alternate site to read this article. "PFO [Personal Freedom Outreach] continues to investigate preacher Benny Hinn's claim that his father once was mayor of Jaffa, Israel (The Quarterly Journal, July-September 1992, pp. 1, 10-14). That investigation has revealed that for a number of political and historical reasons, Costandi Hinn, a Jaffa-born Arab, could not have been mayor of an almost totally Jewish city. Jaffa technically did not exist after 1948 because it was merged with all-Jewish Tel Aviv forming one municipality called Tel Aviv-Jaffa. There was no city of Jaffa when Benny Hinn was born." "While we rejoice in the good Christian literature being published by Thomas Nelson Publishers, they must be held to account for publishing a book as unsound as this one. " "I would not have believed he (Benny Hinn) had said this except that someone sent me a recording of the entire program! " "Segment from the Feb. 2, 1998 BBC 1 TV program "Here And Now." It examines the Christian Channel Europe, and deals with Benny Hinn in the process. You will need RealPlayer to listen to this broadcast." Here's an e-mail we recently received about Benny Hinn's appearance in Ghana, where he claims a dead man was raised from the dead. Upon closer inspection, it never happened. "According to Benny Hinn, God moves in “marvelous” ways — even to the extent of calling off professional sporting events. Or does He?" If this isn't a perfect picture of where the love of money leads, I don't know what is. The Bible says that Balaam the sorcerer "ran greedily" for profit. Necromancer Benny Hinn seems to be having the same problems. Other articles showing problems in and around the Hinn organization by the Orlando Sentinal include "Nightmare Of Heroin Hits Hinn Ministry" , "Shameless Hype Infects Local News" and "Hinn's Foes To Settle Suit With Sheriff In Orange". "Benny Hinn is a Roman Catholic mystic, who is taking the Pentecostal and Charismatic Church down the ecumenical road towards Rome." "Frequently when presenting the following and similar facts about Benny Hinn we encounter the statement: "Yes but Benny Hinn has repented and so it's wrong to dig up the past." However the Bible position regarding serious sin (heresy is a serious sin) is that it carries consequences. Furthermore the Bible clearly teaches that true repentance results in a change of behaviour. We publish this article with a deep sense of compassion and concern, especially for the large numbers of Christians who are confused or deceived but also for Mr Hinn himself and for those who endorse, sponsor or promote his meetings. Those who deceive are frequently deceived themselves. We must look at the facts." "Benny Hinn and this kind of supernatural phenomena could not exist in a biblically-centered atmosphere. His errors would be immediately exposed in discerning, Bible-believing congregations, submitted to and operating within the Word of truth. There is no room for Holy Ghost theatrics. The further removed from God’s revelation people get, the more they will succumb to spiritual leaders who claim powers from on high, while taking the church away from true worship. When people are steered by euphoric feelings, in awe of the stage and the performers charisma, the heart drifts far from God." Featured in the May 24th / June 8th, 2000 program is a clip from the Nairobi Crusade where Benny claims to cast out 13 devils from a Hindu woman. Does this prove Benny Hinn is a man of God? No, it does not! 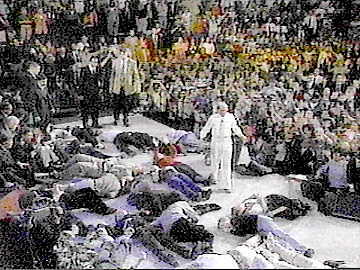 On the June 5th / 9th, 2000, "This is your day" program, is a tape of a Nashville crusade where Benny fills the stage with incapacitated young people "slain in the spirit", an unbiblical and false manifestation of the "fire" of the Holy Spirit being called from heaven. 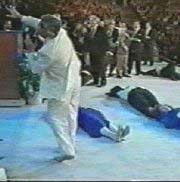 The August 10th, 2000 "This is your day" featured an extraordinary clip from the recent Chicago crusade where Benny Hinn casts the fire of the Spirit on portions of the audience, and many are "slain", falling in large groups. 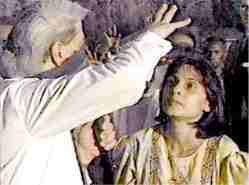 The most popular televangelist and faith healer in the world today is probably Benny Hinn. He is often featured on Trinity Broadcasting Network (TBN). The itinerant preacher some call a "prophet" travels worldwide to stage his "crusades." 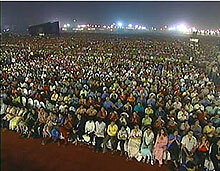 Thousands pack stadiums and amphitheaters hoping to be healed. However, Hinn has failed to prove even a single "healing" objectively. And like the recent "clone" claimed by a "cult," his claims of "miracles" also seem to lack meaningful proof through science. Instead, people apparently feel "healed," therefore they are "healed." Again and again the media has scrutinized the minister and found him wanting, through either his apparent knowing manipulation of the faithful and/or just plain money grabbing. The latest exposé about Hinn just was aired on Dateline NBC. NBC reports that the Benny Hinn Ministry is now raking in more than $100 million dollars annually. Benny Hinn is not a member of the Evangelical Council for Financial Accountability, which includes the Billy Graham Crusade, nor is he legally obligated to disclose his finances publicly. But Hinn has acknowledged that his yearly salary is somewhere between $500,000.00 and $1 million. And that doesn't appear to include all compensation, such as travel expenses or other questionable perks. Hinn's travel expenses alone must be astronomical, given his penchant for luxurious presidential suites, which can easily run more than $1,000.00 a night. He also likes to fly to Europe on the Concorde, which is $8,000, a pop. But perhaps the most outrageous of Hinn's recently exposed perks is his so-called "parsonage," which will cost $3.5 million dollar to build. The house has 7 bedrooms and 8 baths and includes 6,000 square feet, a view of the Pacific and room for ten cars in its underground garage. Benny likes BMWs. And to think that Jesus was born in manger and rode into Jerusalem on a donkey. And the Apostles weren't exactly high rollers either. The money to fuel Hinn's expenses and perks comes from contributions to his tax-exempt ministry. 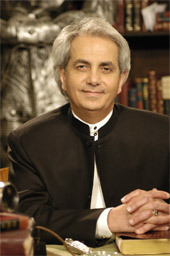 For some time I have maintained an archive about Benny Hinn within my website. The response has been interesting. Some visitors are happy to have access to the information. One emailed, "Mr. Hinn should know that good works have value in the eyes of God, but not the fortune he has accumulated by preying on naive people." Another said, "I suspected Benny Hinn when he appeared on talk TV shows, and also because he is such a showman. I personally attended one of his crusades. I saw children that looked like they were dying, but couldn't get to him. Benny Hinn is not giving hope to people, but destroying any hope that many had to start with. It's my opinion that people who use God to gain power, money, fame, fortune and have no interest in the souls of the people they minister to, will have to answer to the Savior one day." But perhaps the most telling response is from Hinn's fans that are not so happy with me. One wrote, "I would be very careful about messing with God's Anointed! Benny Hinn is anointed. God does love you. Please listen to God." 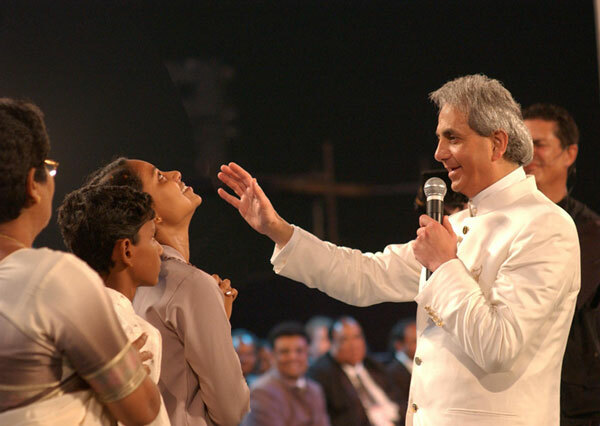 Many of those who attend Benny Hinn crusades seem to think the faith healer and God are virtually synonymous. Another Hinn fan said, "It takes money to be on TV and to do crusades. By giving 'into good soil' we, are blessed. God Blesses His people and Benny Hinn is a man of God. Why is everyone hung up on money? The streets in heaven are paved with gold." But some of the faithful can get downright nasty. One angry Hinn groupie wrote, "Have you ever attended a Benny Hinn crusade or any other man of God? If you had, you would be ashamed of yourself and immediately destroy this website. However, I know you Satan. I know the deception you so cleverly weave around men." One of Hinn's true believers put it more succinctly, "God rules not Satan you stupid idiot." “Pope John Paul II pointed millions to Jesus Christ when he was Pope. And I believe we're in for the greatest move of the Spirit of God on this planet." —BENNY HINN (Benny Hinn: The Impact of the Pope's Death, By Chris Mitchell, Middle East Bureau Chief, CBN.com). "Howbeit in vain do they worship me, teaching for doctrines the commandments of men." Deceptively, Benny Hinn presents the Gospel of Jesus Christ on his website. Benny Hinn also teaches that there are NINE members to the Godhead. Hinn is very deceptive. If you look at Benny Hinn's website, you might be totally convinced that he's a born again Christian. Yet, Hinn's life contradicts his statements. If a famous preacher claimed to believe in freedom and America; but then you find out that he was a member of the Communist Party at the SAME time, what would you think? That man is Martin Luther King Jr. Would you believe his words about freedom? No! Likewise, Benny Hinn presents the Gospel on his website; but, then praises the Pope, recognizes Our Lady of Fatima (Mary) as legitimate, partakes of transubstantiation (Catholic holy communion), and promotes Catholicism—The biggest cult on earth!